A corporation subscription will provide you memberships for max 10 of your employees. The detailed information will be transmitted by e-mail after the validation of the subscription. A corporation subscription is not considered as a sponsorship. Our seminars are free for our members. You will also have a priviledged access to our advices in terms of professional orientation and entrepreneurship. We propose also some benefits for our events, such as the Global Game Jam. To become a COIN member, just fill in this form. The process is fully automatic and you will receive an confirmation mail after completion. This form will redirect you to Paypal, which will enable you to pay safely with a Credit Card or your Paypal account. 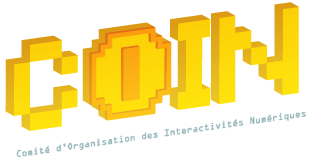 It is also possible to become a COIN member during our seminars and some of our events. A membership have to be renewed each year to remain active. Do you have problems registering online? Feel free to contact us. Do you wish to encourage our activities? One donation can help us to propose better services to our members and to organize better events.